The BHP Score reports are awesome. Thanks a million to the graders at Arizona State University for giving such timely feedback. Students loved the written feedback coupled with the visual charts (it is so helpful for them to see their data). It was also handy to have their essays printed on the backs of the Score report so that students could reference them as they examined the feedback. BHP Score report. Click to enlarge. So, how exactly did I use Score feedback with my students? We went over the reports for Investigation 2 (“How and why do individuals change their minds?”) together in class, alongside the BHP Writing Rubric. Students circled where they were on the rubric and then reflected on their strengths and weaknesses. Each student set specific goals around areas where they want to focus and improve upon for Investigation 6, which is the next Investigation for which a Score report will be available. They had to identify the specific skills they would need to demonstrate to move up one step on each of the four criteria. I encouraged them to be specific by using the language from the rubric in their reflections. A lot of students mentioned that the feedback indicated they needed to state an opinion or position clearly and give some paragraph structure to their essays. No one had included a counterclaim (and very few knew what that meant), so we also spent some time discussing the language in the rubric. We also talked a lot about “cherry-picking” information from the text without citing, analyzing, or connecting it to anything. After some critical reflection, students went back into their Google Doc version of the Investigation and attempted some fixes. We focused on establishing a clear beginning (intro) and claim (using a thesis rubric students had seen in the past). We’ll build more on this later. We filed away their reflections, rubrics, and score reports into a folder that we’ll pull out every time we do an Investigation. As a teacher, hearing students think through their reflections out loud and on paper was enlightening. I know now that we’ll need to do some mini-lessons on writing claims with a clear position, structuring essays that support the claim, and addressing counterclaims. We’ll also build in some mini-lessons on citing sources and analyzing texts (rather than cherry-picking ideas and quotes from them). These are skills I can easily build into daily activities and routines. For Investigation 3, we’ll just work on hitting the proficient column in Criteria A and B—focusing especially on making a claim that is supported by the structure of the essay. Overall, our school’s Big History team is pretty pumped. Another BHP teacher literally came running into my room raving about the Score reports. She passed along an exciting review to our district admin office—and they’re loving this, too. Score has freed up time for me to work on differentiating my instruction instead of focusing all my time and energy on grading and feedback. I’m able to take a few concentrated hours to comb through results and plan mini-lessons for future Investigations. BHP Score also allows me to check my own grading practice against a group of experienced graders. Want to learn more? 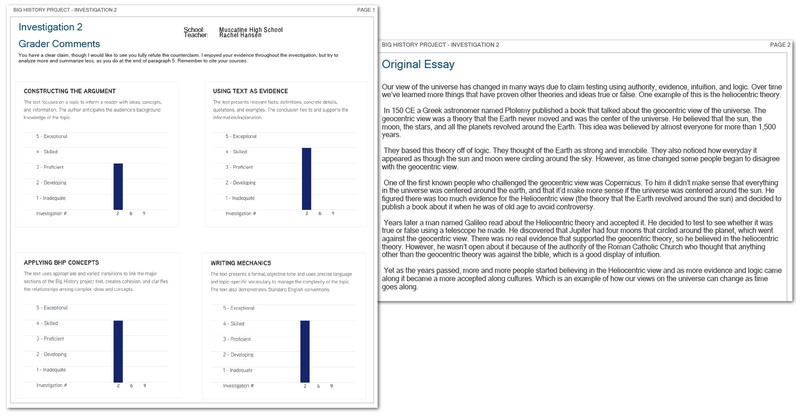 Check out our past blog posts to get an overview of BHP Score and to learn how we grade student writing. About the author: Rachel Hansen is a high school history and geography teacher in Muscatine, IA. Rachel teaches the BHP world history course over two 180-day semesters to about 50 ninth- through twelfth-grade students each school year.